Case binding is very similar to perfect binding, but uses a hard cover rather than a soft cover. Called a case — hence the name — the hard cover is then wrapped in book cloth or faux leather or leather, and the title is usually foil stamped on the front cover and spine. These books are not only classic and elegant looking, but are also more durable than a perfect bound book. Of course, you also can opt for a dust jacket to protect the cloth cover and add customized cover art. For our hardcover book binding services, the inside pages are stacked and glued like perfect bound books with the addition of end sheets. 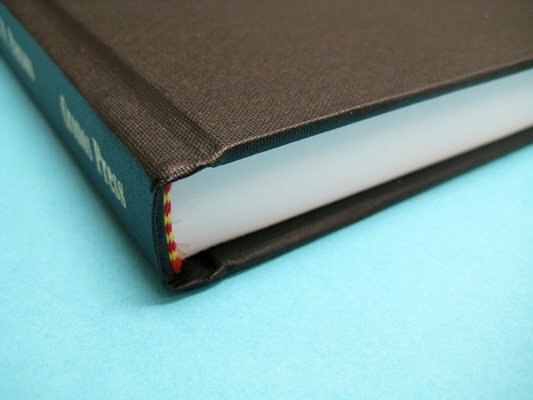 You also can choose to have your pages Smyth sewn for even more durability. This stack is then glued inside of the case. Printed case books give you the durability of a hardcover book and let you put your artwork onto the book cover like a perfect bound book. The binding method is similar to case bound books, but gives the book a completely different look. Mechanically, the process for binding these books is the same as case bound, but the cover is printed on paper that is then applied to the outside hardcover boards with adhesive (instead of the cloth or leather used for case bound binding).